One giveaway down, another to go! Thanks to Eltima Software, we have two copies of SyncMate 2.0 Expert Edition (each valued at $39.95 USD) for you to snag. 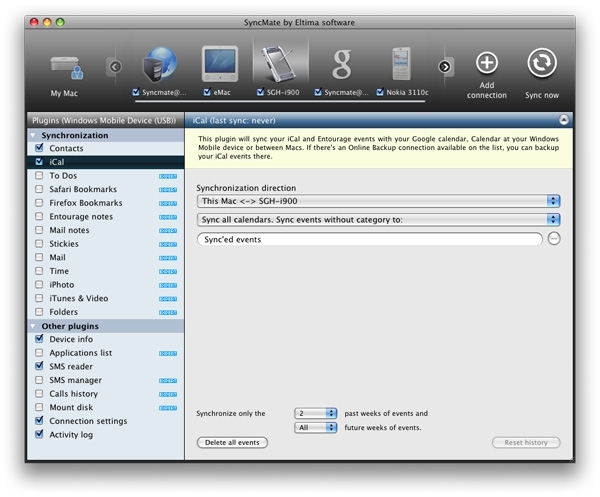 The sync application is compatible with Mac OS X, and offers a plethora of sync options between Windows Mobile (and other smartphones), Google accounts, and Mac OS-based applications such as iCal, iPhoto, iTunes, Mail, Address Book, Safari, Firefox, and Entourage. So, what do you have to do to win? Read on and get commenting. Good luck! Leave a comment in this thread, stating the editions that SyncMate is offered in. And here's a hint: there are two editions, and we've already named one of them in this post. Still stuck? Perhaps the SyncMate web page will help you. Only one comment per person. Any more and your entry will be deemed invalid. Note that if you're registering and leaving a comment for the first time, your post probably won't appear right away as it needs to be approved by our friendly moderators. The giveaway is open to anyone and everyone, regardless of where you are in the world. Entries will be accepted until 11:59 PM GMT on September 18, 2009. A total of two winners will be selected randomly and notified via e-mail, so please ensure that a valid e-mail address is linked to your Thoughts Media account. Each winner will receive a single copy of SyncMate 2.0 Expert Edition.